Does removing a card from a graveyard then putting it back make it an invalid target? I also run a Hallar deck, and I'm liking yours a lot. You have a lot of stuff that I don't. In general, I've found that a good way to play Hallar is to focus on providing a lot of +1/+1 counters and then using a few cheap kicker spells to trigger Hallar. I tend to avoid most kickers that are expensive or that require multiple colored mana whenever possible. I also like to use something like Reclaim to get back a cheap kicker so I can potentially trigger Hallar twice in one turn. If you use cards like Hunger of the Howlpack and Blessings of Nature to dump counters on them, you can really do some damage with these. They also help to take some of the heat off of Hallar. I like the look of this deck, I took a more combo-orientated approach to my Muldrotha deck, Finalized Muldrotha, but yours is definitely better on a budget. 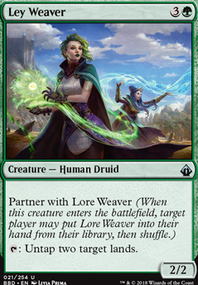 Something I'd recommend is adding Satyr Wayfinder , it's a great two in one ramp / mill card. Pull from the Deep isn't necessarily a great card, but it can be useful if you mill an instant or sorcery you wanted to keep. 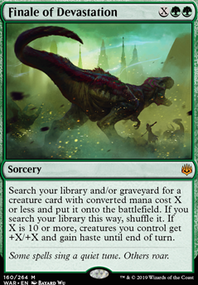 I've dealt with a bunch of graveyard hate in my playgroup, so cards like Noxious Revival (not under $1) or Reclaim (budget version) can be useful tools if you face the same problems. 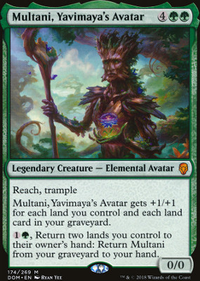 Freed from the Real can go infinite with your Kiora's Follower and a bounce land, though many other untappers can do the same thing, ex Voyaging Satyr . With infinite I'm sure you can find a way to win. Darrinmtg Check the budget section of the primer. Do the best you can for a BUG manabase splashing W (pains, battlebond lands, more shocks, Urborg). Another piece of recursion should replace Will; Treasured Find and Reclaim come to mind but you might be able to do better. I'd consider Will a high priority upgrade at this point. Seal can be replaced with the next best tutor for Food Chain (maybe Sterling Grove ). 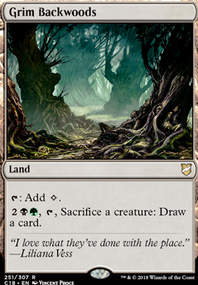 Instead of Timetwister I'd play a 29th land, as the manabase is fairly greedy (and you're using suboptimal lands). Hi ThePainMTG, on your sideboard; Leyline of Sanctity / Leyline of the Void are great answers for certain decks, but for them to be effective you need 3x of each, otherwise you will end up in the multiple mulligan territory. You do not want to cast those cards for 4 mana, that is too slow for what you are trying to answer. Your deck is based on Fist of Suns, with Thran Temporal Gateway and Through the Breach as your primary backup plans. This looks all well and good, except if your opponent targets your mana base heavily, this could be in the form of Field of Ruin , Ghost Quarter or Blood Moon , though Assassin's Trophy and Stone Rain could also appear. Assuming you dodge land destruction you also need to worry about extraction effects like Surgical Extraction . 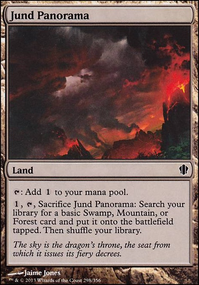 Despite those limitations, which I'll admit, amount to dies to removal this looks like a fun deck, perhaps in need of a few more basic land or some fetch lands. It also needs something like Reclaim , Eternal Witness or Noxious Revival to pull useful cards back from your graveyard. Hope this is of help, good luck with your brew. As I said earlier Creeping is a bad card... Reclaim, Nature's Spiral, Hag Hedge-Mage Reviving Melody and most famous of all Eternal Witness or Noxious Revival. 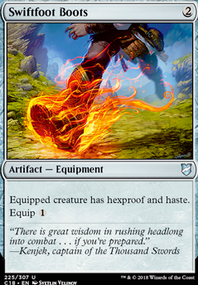 It's pricey but Greater Auramancy grants Shroud, this is like Hexproof except you also cant target the enchantments. Open the Vaults puts any returned cards directly into play, you don't need to recast them, it too is actually better than Creeping, even if it costs 1 mana more. That would include something ridiculous like Platinum Emperion for example, a lot of decks use the graveyard as a resource. hi! i saw an old video of songs of the damn deck with Reclaim, the player haven't able to cast it but the tech seems good, it can become an extra copy of songs / consume spirit / rats, what do you think about it? Hey man! I love the deck and just recently made my own based heavily on yours, so thanks for that! I ended up slotting in a Patron of the Orochi since I had it lying around and wanted to see how silly it was with Seedborn Muse. 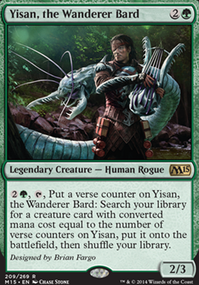 It's a bit redundant, but helps with recovery when Yisan gets hated on. I added Yeva, Nature's Herald, still trying to determine if she's needed or not. Did you ever playtest with her? I added a few more recursion cards, such as Regrowth and Reclaim. Just helped a bit more in my play group.